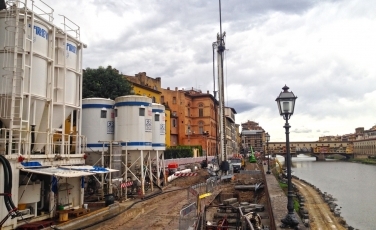 Trevi is carrying out the first phases of the works aimed at ensuring the safety of the Torrigiani embankment which, in May 2016, underwent a structural collapse causing a 3m displacement of the riverbank towards the Arno River. The structural collapse created a chasm which was 80m long and had a maximum depth of 3.5 meters. The contract was awarded to Trevi as there is a need to complete consolidation works, structural restoration and hydraulic protection before winter, to avoid any risk of possible river floods. Trevi have extensive experience in consolidation works and can combine a high operating capacity (staff on three shifts and equipment made available at very short notice), as well as a remarkable design capability. The Design, Research and Development (PRS/DRD) Department who have been cooperating with the client’s technicians since the start of the project for the creation and development of design solutions, have played a substantial role in the urgency for the project, especially as in the first phase of the works, both the design activities and works on the jobsite are carried out almost simultaneously. The working operations demand great care because of the tight schedule and the peculiar location. The location is in the middle of the city centre and Trevi want to minimise the impact of the works on the citizens, but, at the same time, Trevi need to work quickly, in order to ensure safety of the riverbank’s protection wall by early November. The envisaged solution is to build a structure that is both statically and hydraulically functional and autonomous on the back side of the existing wall. This structure is capable of completely replacing the damaged riverbank wall which will be consolidated and kept in the current position.This will ensure the safety of Galleria Poggi and of the existing buildings; it will also reduce pressures and stresses on the existing wall thus improving its stability. Lastly, it will ensure hydraulic protection against the Arno floods and restore the water pipeline and the road traffic on the Lungarno. The suggested operating sequence is based on the principle of progressively increasing structural stability and safety of both existing and ongoing works, in order to constantly operate under acceptable safety conditions. In fact, further to the surveys and soil investigations, which were carried out soon after the event, the first stage of works, that has just been completed, involved the construction of rigid inclusions for the consolidation of the soil volume dislodged and displaced by the instability event, so as to toughen the soil and create a stable work surface, where the equipment required for other activities can be used. In the different and subsequent phases, a PSM-20, a SM-405/8 and a SM-30 rig will be employed; these rigs are manufactured by Soilmec, the Trevi Group Company that designs and produces equipment for special foundation works. Eventually, a wall will be executed adjacent to the Poggi Channel (a masonry tunnel with a diameter of about 5 meters that runs parallel to the Arno River). The wall will have a double function, first it will protect and stabilise the tunnel itself and the buildings located close to the area affected by the instability; secondly, it will support the excavation up to -3.5m from ground level to create a horizontal working platform from which the actual structural works will be performed. These works will consist of 2 walls made of adjacent TRELICON piles with a 600mm diameter, one opposite the other, and connected on the top with capping beams and cross beams forming a rigid frame. Another wall, supporting the frame in the cusp area, will be installed near the dislocated riverbank wall, next to the old foundation of the wall consisting of wooden piles. A vertical wall for soil support and containment, that will be installed to restore the road surface, will be built close to the original historical wall. As for the consolidation of the displaced and damaged wall, the following works will be carried out; an inclined foundation micropiles that will be suitably embedded into the wall; self-drilling rods injected with cement grout; re-compaction of the loose soil below the base of the wall and, finally, repair of the historical wall’s cracks through grouting and plastering works to be carried out via the cut-and-plug technique. For these operations, a service site road, which is currently under construction on one side of the Arno River will mainly be used. The project is expected to be completed by early November 2017.